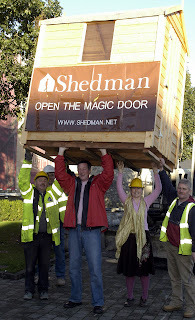 Shedworld, Shedman's personal blog, is now live at www.shedworld.net. It features the random jottings of Shedman on the road, travelling far and wide through shedland. Occasional notes about plans, people, projects - and sheds. Shedworld provides a refreshing personal view of sheds, poetry, and life in general based around Shedman's present and previous projects. As time allows, Shedman will be updating the Shedlife site with projects old and new. If you've met Shedman at projects in the past he'd love to hear from you. - and do send in any reminiscences or pictures if you have them.